Is there a list of Preferred Banking in the Philippines? If so, is there a list with pros and cons? I have here a list below of what I personally know. I did not add the usual benefit that you'd see everywhere like Free withdrawals, investment insights and VIP queue (except for BPI as this is a really big plus if you line up at their queues). If you know any other preferred banking/VIP banking, kindly share. - other than those benefit, nothing else. + Global Advantage - allows you to open account in other countries and transfer for free. Ask ko lang kung anu-ano po yung mga "clubs" sa banks natin dito sa Pilipinas para magkaron ng "preferential treatment" sa kani-kanilang mga banko? Ano pa po yung mga iba? Haha just curious really. You're talking about "mass affluent" banking arms ng banks. BDO is Diamond Rewards not Prestige (pero may Prestige benefits siya). 5M starting. BPI is technically Preferred Banking (Ayala Rewards Circle is a benefit for members of Preferred Banking). You can look into the respective threads ng depositors' threads ng SecB, BPI, etc. Marami na rin discussions about them. EastWest has Priority Banking (parang Private Banking nila), I believe at 2.5M. BDO, BPI also have private banking arms separate pa from what you have sa preferred banking. 5-10M and 25M respectively sila. Citi and HSBC both have mass affluent arms as well (Citi Priority, Citigold, Advance, & Premier - 1M, 4.5M, 100k, 4M respectively). Then they also have Private banking arms as well (I know HSBC needs 5M USD minimum). They all have different perks, benefits, and uses. Please defer to the respective threads for more in-depth analysis nila. BDO is BDO Private Banking dba? PNB is Prio1 pero bubuhayin pa ba nila ang PNB Pinnacle? Really depends on what you need and which ones are close. More or less the same. 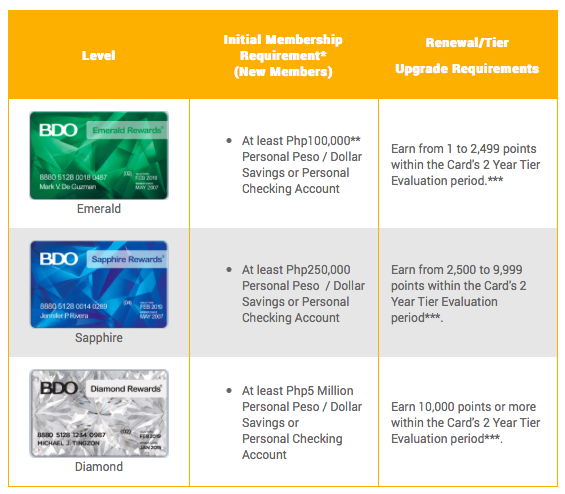 Just to add - BDO Diamond gets priority lane sa any branch too (better than BPI's priority lane since there are more branches especially on weekends). In my experience, unless you're not in your branch, hit and miss ang "preferred" treatment ni BPI. Citi and HSBC get plus points for me since you get real 24/7 banking (with cheque deposits any time), not just a cash machine. HSBC Advance already lets you open accounts anywhere in the world with a fee (Premier does this for you for free). Great if you travel a lot or stay abroad for a certain amount of time. Add EWB Priority - min of 2.5 M to quality. HSBC Premier at 4m, HSBC Private at 5M USD. BDO Private at 10m. BPI Private at 25m. Tanong ko lng tungkol sa bdo diamond perks. Paano kung my elite ka na sa kanila tpos emerald reward ka na before since my account ka sa kanila. Di ka na eligible sa initial requirement na Elite Cards + malaking CA/SA para sa Diamond level. Kailangan mo makakuha ng 10,000 points during two-year evaluation period. Wala ng ibang paraan pa sa pagkakataong ito. Kailangan maka earn ng 10k points kasi meron ka na. Sa initial card lang yun. Salamat po sa sagot. Ang hirap mag diamond jusmiyo 😂.